It was my pleasure to produce Yank Rachell with his good friend Henry Townsend, at the Missouri Historical Society in 1990, and also to see his superb performance here in "The Scottsboro Boys" which mixed a narative concerning the famous case with musical interludes from Yank and Leroy Pierson. And to pick a little guitar with him during a lull in rehearsals. Yank was a fine gentleman with a kind disposition, and a blues artist of the highest caliber. 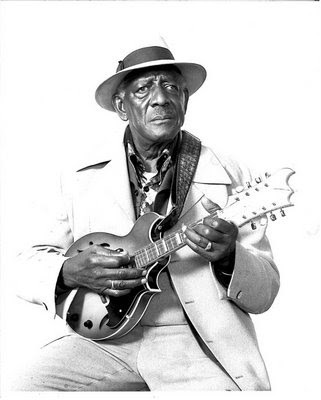 James "Yank" Rachell (mandolin, guitar, vocals - 87 years old) was one of the few blues musicians to play mandolin as a primary instrument . Blues mandolinists are not exactly commonplace and because he was also largely self-taught, his music was even more unique and a testament to his prowess as an instrumentalist. He was born in 1910 on a farm outside of Brownsville, Tennessee. How Rachell chose the mandolin is a classic blues story. Rachell's mother had given him, then eight, a young pig to be raised for butchering that fall. One day he was walking down the road and saw a neighbor playing a mandolin on his front porch. He loved the sound and was determined to get the mandolin. Rachell asked how much he wanted for the instrument, and the man said five dollars. He didn't have the money so he offered to trade the pig for the instrument. When Rachell went home his mother was very upset. He recalled her saying "Next fall when we're all eating pork, you can eat that mandolin". It turns out he didn't have to eat the mandolin. Rachell taught himself to play the mandolin and soon was making a living as a musician. Soon Rachell met Hambone Willie Newbern (recorded the first version of the blues classic Rollin' and Tumblin in 1929), who became his mentor. The two performed in and around Brownsville at house parties and fish fries. It was at one of these parties that Rachell first met and played with Sleepy John Estes (whom Rachell played and remained friends with until Estes' death in 1977). They teamed up with harmonica and jug player Hammie Nixon and the trio played as a jug band throughout Tennessee and other parts of the South. In the mid-20s, the trio relocated to Memphis, playing gigs and busking in Handy Park. Later in the decade, Rachell, Estes, and pianist Jab Jones formed the Three J's Jug Band and became a popular attraction in clubs on Beale Street during the Memphis jug band craze. In 1929, the Three J's recorded for Victor. Their first recording, Broken-Hearted, Ragged and Dirty Too, sold well enough that Victor brought them back to record five more songs, including the blues classic Divin' Duck Blues. The group also backed up harmonica wizard Noah Lewis for his Victor recordings. When the Depression kicked in and killed off recording, particularly in the "race" field, Rachell and Estes decided to move to Chicago where they recorded for Decca and Bluebird. Rachell was less of a rambler and soon returned to Brownsville. There he farmed and, lying about his age, got a job for the L&N Railroad. He soon married, settled down, and started a family. Rachell continued to play at house parties and fish fries in Jackson where he met John Lee "Sonny Boy" Williamson. The two became friends and soon were playing together constantly in Jackson and Brownsville. Rachell and Williamson remained musical partners until Williamson's death in 1948. Williamson and Rachell went to Chicago in 1938 to record for Bluebird, appearing on each other's records. Rachell's steady mandolin and guitar playing gave Williamson a solid base from which to launch his frenetic harp solos. Rachell, like many bluesmen, moved north to St. Louis then to Indianapolis in 1958. In the sixties Sleepy John Estes was "rediscovered" living in Brownsville. The two soon teamed up again with Hammie Nixon, playing coffeehouses, concerts, and festivals in the U.S. and Europe. They recorded for record labels Blue Goose and Delmark. After Estes' death in 1977, Rachell cut back on his performing and recording. 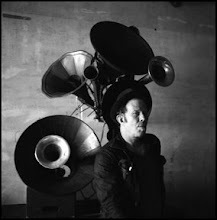 Rachell recorded solo records for Blind Pig, JSP, Wolf, and Slippery Noodle Sound. Rachell's sixty-six year recording career must be some sort of record. Blues giant B.B. King once told Rachell, It's people like you that made people like me possible. King would go to see Rachell perform regularly when he was getting started and you can hear some of Rachell's approach in King's music, as well as other Memphis bluesmen after the 1920's. Certainly Divin' Duck Blues became a blues standard (covered by Muddy Waters and Lightnin Hopkins and even Jelly Roll Morton recorded the song for the Library of Congress). Rachell's guitar and mandolin playing on John Lee "Sonny Boy" Williamson's records were certtainly an influence on a lot of musicians. A gifted and innovative songwriter as well, Rachell's hits of his own were ``reworked'' by many artists including Taj Mahal (She Caught The Katy), Jimmy Rogers (Ludella Blues) and Blind Boy Fuller (turned Rachell's Gravel Road Woman into I Don't Want No Skinny Woman). Like many musicians who played country picnics or medicine shows, Rachell had a reputation for a "clowning" instrumental prowess, sophistication and visually impressive tricks like throwing the mandolin in the air and strumming a chord as he caught it. But no matter the time or place, live or on record, With over 75 years of musical achievement, Rachell's music seemed to reach back to earlier times. Molto bello, anche se la scelta dei brani è forse un pò troppo scontata. 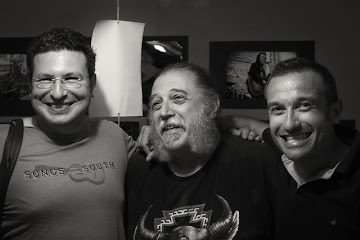 A parte le preziose gemme di David Grisman, Tim O'Brien e Rich Del Grosso, il resto non mi sembra di altissimo livello, ma come sempre è una personalissima opinione.